This site provides useful practical information related to global and national weather observing practices and instruments, including independent equipment reviews. 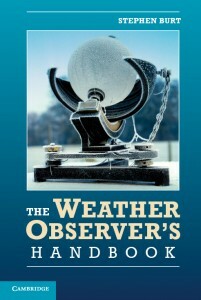 You will find much of the background in my book The Weather Observer’s Handbook (published by Cambridge University Press), details of which can also be found on this site, together with useful links and downloads. A nation obsessed with the weather? Yes, certainly, but which nation? To obtain records of the timing and intensity of rainfall, one or more recording raingauges are often sited alongside the manual raingauge. The record from the manual gauge should be taken as the standard period total and sub-daily records (hourly totals, for instance) taken from the recording gauge adjusted to agree with the daily total taken from the manual gauge. The use of standalone recording gauges is not recommended when accurate or comparable rainfall totals are required. Most budget automatic weather station (AWS) packages will include a pre-programmed datalogger with display software, although flexibility and expandability may be limited. Sophisticated programmable multi-sensor loggers and software are highly expandable, but are considerably more expensive and complex to programme and use. When choosing a weather station, or components of a weather station, carefully consider the key decision areas. Should the system be cabled, or wireless? Is it easy to set up and use? How many sensors are offered, and how accurate and reliable will they be? Are all the sensors mounted in one ‘integrated’ system, or can they be positioned separately for the optimum exposure in each case? Do the records obtained need to conform to ‘official standards’? Examples and suggestions are given in The Weather Observer’s Handbook. Satisfactory site and sensor exposure are fundamental to obtaining representative weather observations. An open well-exposed site is the ideal, of course, but with planning and careful positioning of the instruments, good results can often be obtained from all but the most sheltered locations. Instrumental readings are of course vital in making observations of the weather, but for a complete picture non-instrumental and ‘narrative’ weather observations are equally important, especially for the analysis of severe weather events.